The waters surrounding Antarctica may be one of the last places to experience human-driven climate change. New research from the University of Washington and the Massachusetts Institute of Technology finds that ocean currents explain why the seawater has stayed at roughly the same temperature while most of the rest of the planet has warmed. The study resolves a scientific conundrum, and an inconsistent pattern of warming often seized on by climate deniers. Observations and climate models show that the unique currents around Antarctica continually pull deep, centuries-old water up to the surface - seawater that last touched Earth's atmosphere before the machine age, and has never experienced fossil fuel-related climate change. The paper is published May 30 in Nature Geoscience. "With rising carbon dioxide you would expect more warming at both poles, but we only see it at one of the poles, so something else must be going on," said lead author Kyle Armour, a UW assistant professor of oceanography and of atmospheric sciences. "We show that it's for really simple reasons, and ocean currents are the hero here." Gale-force westerly winds that constantly whip around Antarctica act to push surface water north, continually drawing up water from below. The Southern Ocean's water comes from such great depths, and from sources that are so distant, that it will take centuries before the water reaching the surface has experienced modern global warming. Other places in the oceans, like the west coast of the Americas and the equator, draw seawater up from a few hundred meters depth, but that doesn't have the same effect. "The Southern Ocean is unique because it's bringing water up from several thousand meters [as much as 2 miles]," Armour said. "It's really deep, old water that's coming up to the surface, all around the continent. You have a lot of water coming to the surface, and that water hasn't seen the atmosphere for hundreds of years." The water surfacing off Antarctica last saw Earth's atmosphere centuries ago in the North Atlantic, then sank and followed circuitous paths through the world's oceans before resurfacing off Antarctica, hundreds or even a thousand years later. Delayed warming of the Antarctic Ocean is commonly seen in global climate models. But the culprit had been wrongly identified as churning, frigid seas mixing extra heat downward. The study used data from Argo observational floats and other instruments to trace the path of the missing heat. "The old idea was that heat taken up at the surface would just mix downward, and that's the reason for the slow warming," Armour said. 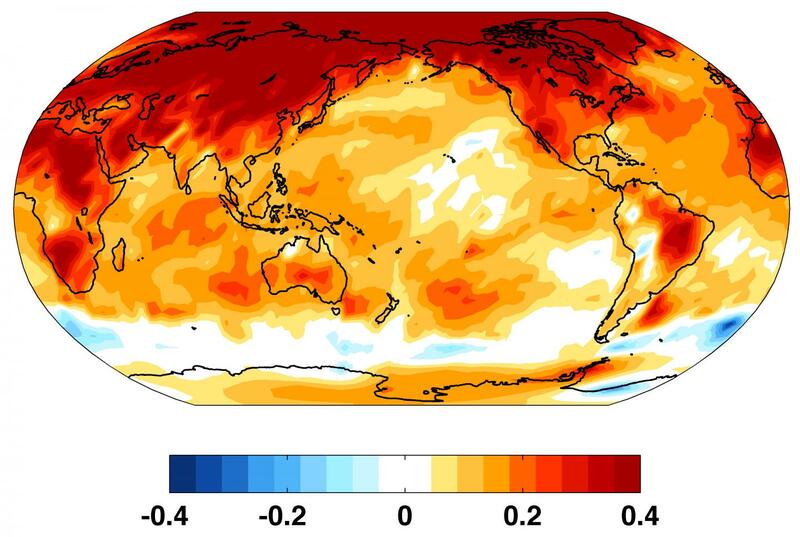 "But the observations show that heat is actually being carried away from Antarctica, northward along the surface." In the Atlantic, the northward flow of the ocean's surface continues all the way to the Arctic. The study used dyes in model simulations to show that seawater that has experienced the most climate change tends to clump up around the North Pole. This is another reason why the Arctic's ocean and sea ice are bearing the brunt of global warming, while Antarctica is largely oblivious. "The oceans are acting to enhance warming in the Arctic while damping warming around Antarctica," Armour said. "You can't directly compare warming at the poles, because it's occurring on top of very different ocean circulations." Knowing where the extra heat trapped by greenhouse gases goes, and identifying why the poles are warming at different rates, will help to better predict temperatures in the future. "When we hear the term 'global warming,' we think of warming everywhere at the same rate," Armour said. "We are moving away from this idea of global warming and more toward the idea of regional patterns of warming, which are strongly shaped by ocean currents."